Indicator Birding - Unexplored Birding Areas? The avifaunal richness in the Southern African region is remarkable, and some of the very best birding areas are still to be discovered. This image is a false mosaic satellite image, and we have heard reports that the area harbours large numbers of birds. Wow, just look at the variety and scale of the size of the area, with little signs of human activity!! Any ideas where it might be? If you think you know, Replies now received - see below for the answer to this puzzle! Thanks to those who tried out the challenge of identifying the locality pictured in the satellite image. Rob de Rover, Pieter van Zyl, Clive Prior, Mark Todd and Kevin Ravno all figured out that this was indeed close to the mouth of the Save River in Mozambique. 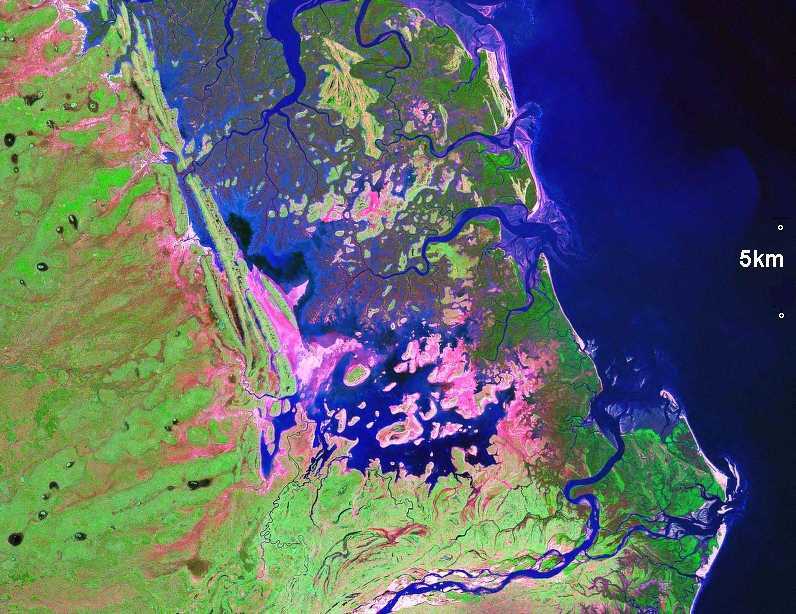 Pieter and Kevin also sent me some other images which provide more detail on the locality, which is characterised by a massive lagoon system, extensive mangroves and coastal floodplain areas - as well as an offshore island. Inland this is the "Save woodlands", which are site 267 in the Southern African Birdfinder. The well known Save Pan is just south of this reserve and is absolutely miniscule compared to this area. This area is actually part of the Rio Save Game Reserve which covers a large tract of land central mozambique - purportedly the second largest privately managed game reserve in Africa.